Clifton Park, NY- On August 3, 2010 the Clifton Park Center held a press conference that announced details on movie theater renovations and the businesses opening in the near future. The hotel coming to the Clifton Park Center will be a Hilton Garden Inn. It will be a 1,200-square-foot, five-story building that will have 108 rooms. It will offer cooked-to-order breakfast, WiFi, and conference and banquet rooms. It will also have direct mall access which is a unique feature. The planned renovations to the Regal Clifton Park Center 8 were announced last week. The plan is to demolish the existing theater and create a completely new structure. The new theater will be called Regal Clifton Park Stadium 10. When finished it will be state-of-the-art, 10 screen theater that will offer Real D 3D technology, stadium seating, high-back rocking recliners, a computerized indoor box office, and a party room. Stadium 10 is scheduled to open by the end of 2011. The Olive Garden:: Scheduled to open in 2012, the italian eatery will sit toward the north entrance of the mall parking lot as an out parcel. This will be the chain's second location in the capital region; the other location is in Colonie, NY. The Meat House:: The small chain has a location in Saratoga, NY and offers a selection of fresh meat, cheeses, and marinades. It is the modern revival of the neighborhood butcher- helping you to create a gourmet meal in one stop. Buffalo Wild Wings Grill & Bar:: A wing joint that offers14 different signature wing sauces. BW3's is not only a great place to watch the game, but it is also one of the fastest growing chains in the country. The restaurant will open in September 2010. 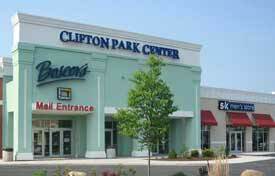 The Clifton Park Company, DCG Development bought the mall in 2006 and has been transforming the Clifton Park Center since then. They want to take it from a traditional mall to a Destination Lifestyle Center. President of DCG, Donald C. Greene, said "With the addition of a brand new "state of the art" 10 screen Regal Cinema, the Hilton Garden Inn and Conference Center as well as the Olive Garden and the area's first Buffalo Wild Wings Grill & Bar, Clifton Park Center will become the leading destination for dining, hospitality and entertainment in the Capital Region." And that, " shoppers should look forward to additional exciting announcements in the coming months."